I recently accepted a challenge from Barb at the Everyday Home to create something beautiful and useful using a $1.00 glass candle holder from the dollar store. 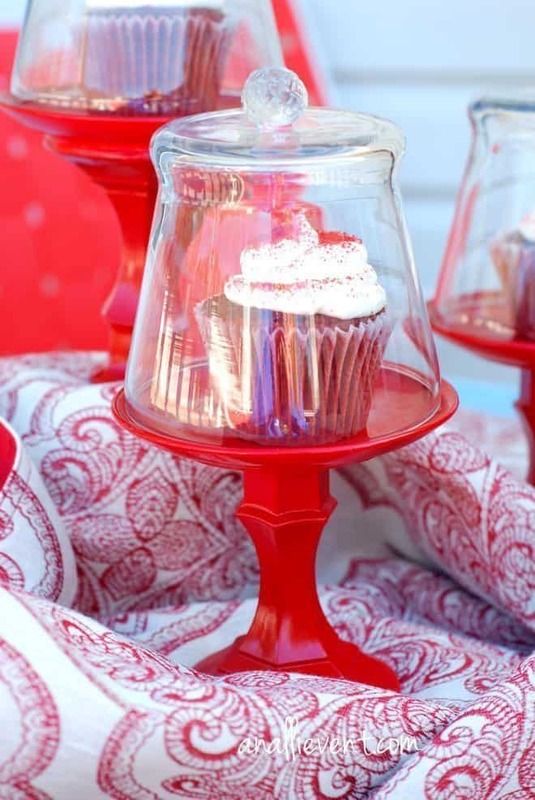 I’m excited about this DIY Sollar Store Cupcake Stand! You can find all the beautiful creations here. Ideas began to take shape in my mind and I headed to the dollar store knowing what I was going to make. Of course, when I got there, the one item I needed to go along with the candle holder was nowhere to be found. So, I adjusted my sails and prepared to change course as I perused the aisles of that store. And then it hit me like a ton of bricks. (She’s a brick house is now playing in my mind). 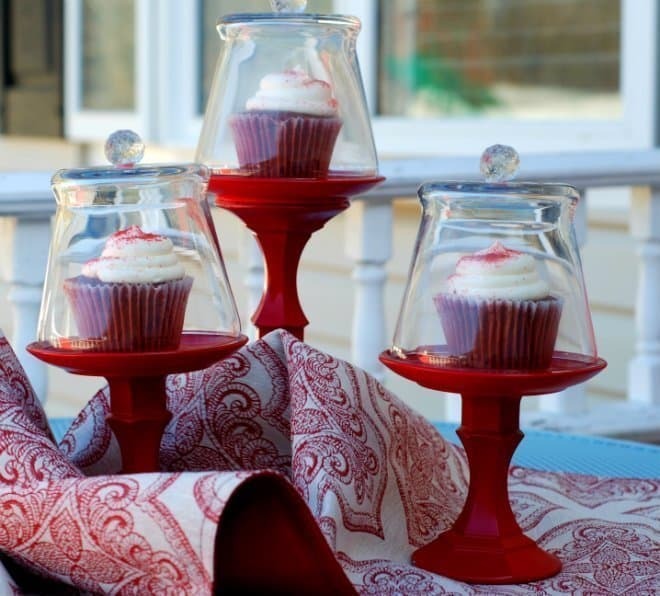 You know those cute little glass cupcake stands with the cute little domed cover and cute little knob on top? The ones that hold just one lone cupcake? I love those things and every time I plan a party I think about using them, but I would need a lot of them and the price never seems to fit within my budget. I’ve seen them priced from $14.99 each (online and big shipping fee) to over $40.00! Nope. Not gonna happen. I was so excited when I realized I had 4 little cheese plates that I had ordered out of a magazine when trying to help a kid raise money for her school. Those little plates had been sitting way up in a kitchen cabinet and had never seen the light of day. They fit perfectly into my little project! And from the get go, I had made the decision to only use craft items I had on hand (except that I was out of glue and had to purchase some). And I knew I wanted to spray paint (why, oh, why is it raining today?) the body because I didn’t want to just have the entire thing be glass. That’s no fun! 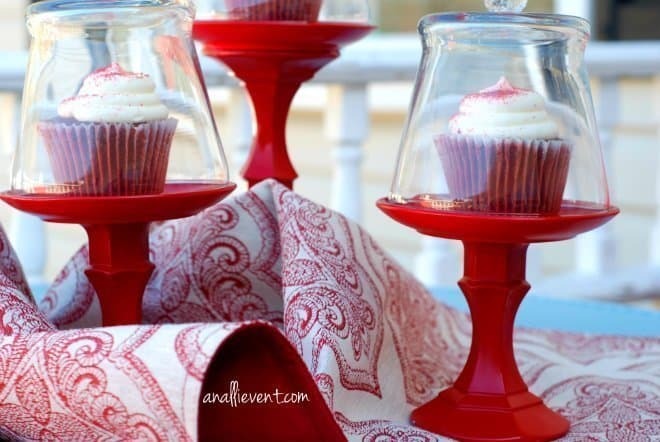 Thankfully, I had plenty of red spray paint left over from Christmas and since it’s almost Valentine’s Day and my favorite color is red and my dining room is red and I can use these cupcake stands for any occasion, the red spray paint won! Now, I do have some neon pink . . . better save that for something else. Actually, the only thing I had to buy at the dollar store was the domed cover. I had plenty of the $1.00 glass candle holders left over from another project. I did make a trip to Hobby Lobby to buy glue and the knobs for the top of the domed cover. And the knobs were half price and I used my Hobby Lobby coupon from my phone, so the glue was almost half off, too. 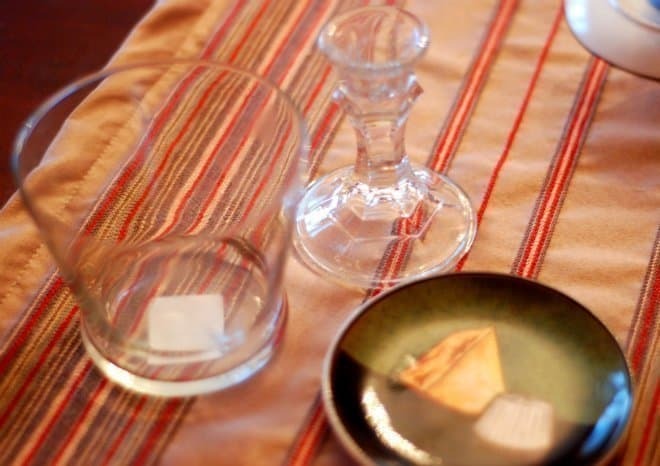 Find the center of the bottom of the plates and glue to the top of the glass candle holder. Glue knob to top center of the domed glass. Let set overnight. 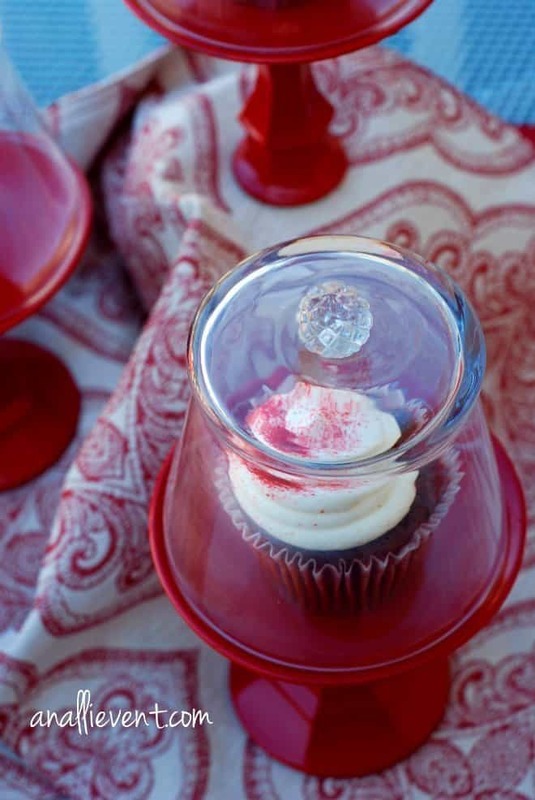 Spray paint the bottom of the cupcake stand and let dry. You’re done. Very creative! i love the Dollar Store. They have a lot of neat things if you’ll just look around. Thank’s for the idea. This is beautiful! You are definitely very creative! I love them! They look great. OH. MY. GOSH. I LOVE THESE!!!!! I’m pinning! What a fun project! Kristen from The Road to Domestication recently posted…Did You Hear of the City on a Hill? It was fun! We will be doing this once a month using whatever dollar store object Barb picks. I have to say I really enjoyed it. I love how this turned out! This was such a fun project! WOW!!! I’m beyond impressed. I would never look at the original item and think cupcake stand especially the way you transformed them!!! Amazing how great glass can look spray painted … shapes transform with a solid color vs the clear of glass (or crystal). Great bold color used on a small item = impact. These will work so well for a valentine’s celebration too. Girl ! You were born clever, weren’t you! These make great centerpieces for a Valentines Tablescape. I’m on my way to see the other creations now, Pinteresting along the way! How do you come up with this stuff? So clever and beautiful. I totally want to copy this! Kathleen recently posted…It’s a Christmas Miracle! We have plumbing!! Hi Alli, your cupcake stands need to get together with my dessert stands that I made! Similar ideas but I love how you made a little dome for yours! Thanks for participating in the challenge! It has been fun seeing what everyone has created! Pinning your beautiful photos! Really cute! And if you were inspired to do so, you could change up the colors any time you want! tammigirl recently posted…Calling All Amazing People! Well aren’t you a clever one 🙂 I love this idea!! This is so cute! I hope you are one of the winners of this challenge. Hi Alli, I bought all the material at the dollar store except for the knob….where do I get them? Would Michaels or JoAnn Fabrics have them? 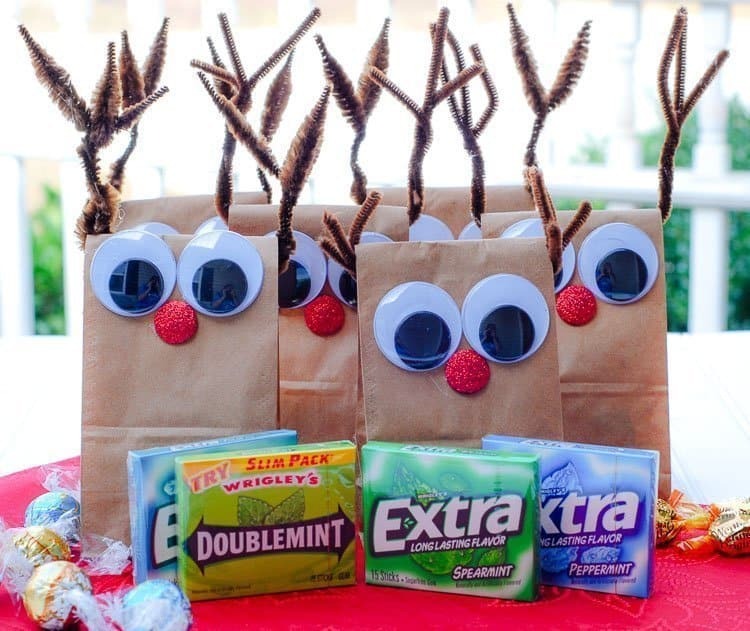 Love this idea – I am making them for mother’s day!!!! I bought my knobs at Hobby Lobby. I hope they turn out great!